MDC Alliance leader Nelson Chamisa. 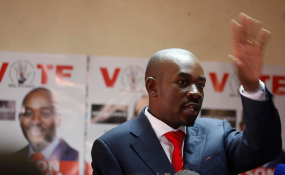 MDC Alliance leader Nelson Chamisa has ordered Masvingo Mayor and party official Collin Maboke to step down for allegedly disobeying party instructions in the wake of a bungled mayoral election process which saw the latter rise to become the city's number 1 resident. The decision was arrived at during a recent meeting by the party's national leadership. Masvingo Town Clerk, Adolf Gusha said he was yet to receive any formal correspondence from the opposition notifying him of Maboke's purported sacking.